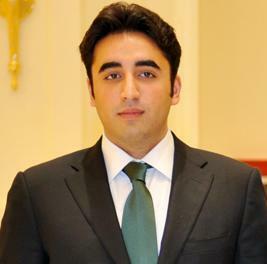 We express our dissatisfaction with the performance the Pakistan People’s Party Led Government in Sindh over range of policy issues including law and order situation, health, education services, natural resource management and other issues affect people directly. This is concern of common people which we would like to raise before the party leadership, the Chief Minister of the province, and the whole Sindh cabinet. 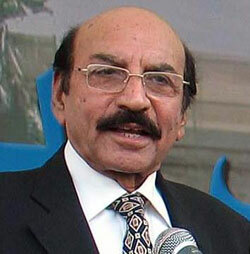 People’s lives are not safe in both urban and rural parts of Sindh from Karachi to Kashmore. Not to talk about the security of common people, the level of protection of lawyers, judges and law enforcement agencies is very low. Every day cases of police personal being targeted by the unidentified perpetrators being reported and this is being continued without any halt. Few months ago, in February, District & Session Judge Hyderabad’s son was gunned down in Hyderabad. Later, there were attacks on lawyers in Karachi. Much time not passed that a senior lawyer Shabir Shars’ nephew was kidnapped from Sukkur. Lawyer Ali Mutahir Shar, son of the the Sindh High Court Sukkur bench additional advocate general, Liaqat Ali Shar was kidnapped when he was kidnapped when he was on his way to Bhitshah from Khairpur. We must quote the words of senior advocate Shabir Shar who expressed his dissatisfaction over police investigation, cooperation and the Governance. 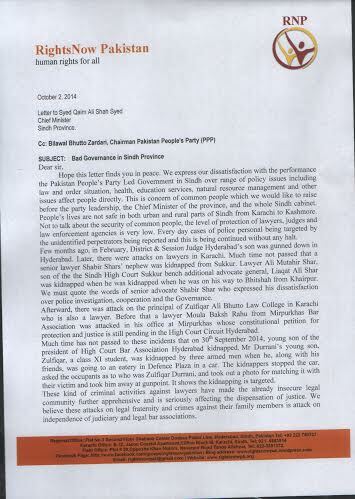 Afterward, there was attack on the principal of Zulfiqar Ali Bhutto Law College in Karachi who is also a lawyer. Before that a lawyer Moula Baksh Rahu from Mirpurkhas Bar Association was attacked in his office at Mirpurkhas whose constitutional petition for protection and justice is still pending in the High Court Circuit Hyderabad. Much time has not passed to these incidents that on 30th September 2014, young son of the president of High Court Bar Association Hyderabad kidnapped. Mr Durrani’s young son, Zulfiqar, a class XI student, was kidnapped by three armed men when he, along with his friends, was going to an eatery in Defence Plaza in a car. The kidnappers stopped the car, asked the occupants as to who was Zulfiqar Durrani, and took out a photo for matching it with their victim and took him away at gunpoint. It shows the kidnapping is targeted. These kind of criminal activities against lawyers have made the already insecure legal community further apprehensive and is seriously affecting the dispensation of justice. We believe these attacks on legal fraternity and crimes against their family members is attack on independence of judiciary and legal bar associations. Apart from these criminal activities against the legal fraternity, the other indicators in education, health, energy and natural resources also show the gloomy picture of the governance. Jobs which should be given to educated, qualified youth on merit and without any racial, political, and other discrimination are being sold in the market like a commodity. No action is taken so far on all inquiry reports conducted by the committees appointed by you. Whether it be report of Disaster in Thar or the killing of two brothers in Umar-kot. Your Chairman has announce to start his political career officially from this October 18th will definitely meet with the complaints of people aggrieved of bad governance in the province. People expect more from democratic governments. One of the expectation of the people from your Government is your and your cabinet’s better performance in the province for realization and protection of people’s human rights but unfortunately people’s these expectation are being diminished. We cannot believe a party whose leadership attained martyrdom, fought with dictators and despotic regimes, seems has failed resolving people’s problems. Before you had an excuse of lack of autonomy in the province in addressing people’s issues and improving governance within province but your that excuse is no more valid after 18th Constitutional Amendment which has removed the Concurrent List in the Constitution and devolved all power including legislation to the province where you are the sole authority. We request you to appoint total 80 honest officers in whole Sindh deployed on pure merit, work without any political interference in their jurisdiction which distorts merit, will dramatically improve the governance in the province. We believe that if four officers in each district (Deputy Commissioner, Superintend of Police, Municipal Officer and Honorable Session Judge) work together. The governance will definitely improve, rights of people will be protected and law and order situation will be fine. That will not only increase people level of security but people’s trust in your Governance and in your party’s leadership. We offer our full support, cooperation in your efforts for the improvement of the governance in the province and wish you best. 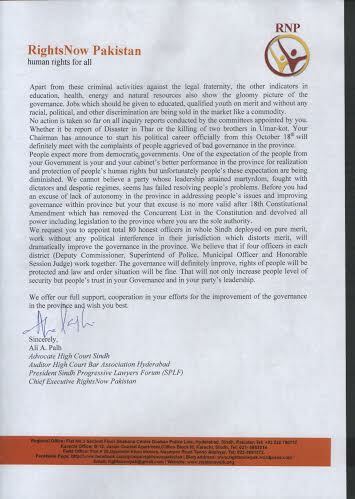 Sincerely, Ali A. Palh Advocate High Court Sindh Auditor High Court Bar Association Hyderabad President Sindh Progressive Lawyers Forum (SPLF) Chief Executive RightsNow Pakistan Email: rightsnowpak@gmail.com http://www.rightsnowpk.org STATEMENT HYDERABAD: We express our dissatisfaction with the performance the Pakistan People’s Party Led Government in Sindh over range of policy issues including law and order situation, health, education services, natural resource management and other issues affect people directly. This is concern of common people which we would like to raise before the party leadership, the Chief Minister of the province, and the whole Sindh cabinet. People’s lives are not safe in both urban and rural parts of Sindh from Karachi to Kashmore. Not to talk about the security of common people, the level of protection of lawyers, judges and law enforcement agencies is very low. Every day cases of police personal being targeted by the unidentified perpetrators being reported and this is being continued without any halt. Few months ago, in February, District & Session Judge Hyderabad’s son was gunned down in Hyderabad. Later, there were attacks on lawyers in Karachi. Much time not passed that a senior lawyer Shabir Shars’ nephew was kidnapped from Sukkur. Lawyer Ali Mutahir Shar, son of the the Sindh High Court Sukkur bench additional advocate general, Liaqat Ali Shar was kidnapped when he was kidnapped when he was on his way to Bhitshah from Khairpur. We must quote the words of senior advocate Shabir Shar who expressed his dissatisfaction over police investigation, cooperation and the Governance. Afterward, there was attack on the principal of Zulfiqar Ali Bhutto Law College in Karachi who is also a lawyer. Before that a lawyer Moula Baksh Rahu from Mirpurkhas Bar Association was attacked in his office at Mirpurkhas whose constitutional petition for protection and justice is still pending in the High Court Circuit Hyderabad. Much time has not passed to these incidents that on 30th September 2014, young son of the president of High Court Bar Association Hyderabad kidnapped. Mr Durrani’s young son, Zulfiqar, a class XI student, was kidnapped by three armed men when he, along with his friends, was going to an eatery in Defence Plaza in a car. The kidnappers stopped the car, asked the occupants as to who was Zulfiqar Durrani, and took out a photo for matching it with their victim and took him away at gunpoint. It shows the kidnapping is targeted. These kind of criminal activities against lawyers have made the already insecure legal community further apprehensive and is seriously affecting the dispensation of justice. We believe these attacks on legal fraternity and crimes against their family members is attack on independence of judiciary and legal bar associations. 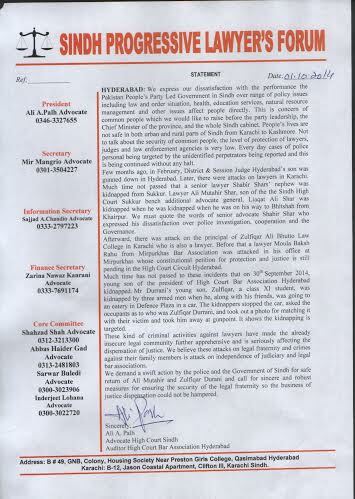 We demand a swift action by the police and the Government of Sindh for safe return of Ali Mutahir and Zulfiqar Durani and call for sincere and robust measures for ensuring the security of the legal fraternity so the business of justice dispensation could not be hampered. KITNE BHUTOO MARU GE? WHO WILL CONTINUE BB’s LEGACY?